The black-faced lion tamarin has a golden body and a black face. Its head and body length is approximately 30 cm (12"), and it weighs approximately 600 g (21 oz). This lion tamarin prefers primary lowland coastal forest (restinga), where it eats fruit, insects, nectar and plant exudates. It is arboreal and diurnal. Black-faced lion tamarins occur in groups of 2 - 11, with an average of 5 members per group. The black-faced lion tamarin was first documented by Western science in 1990 on the island of Superagui, Brazil. By 1995, surveys revealed that it occurred on Superagui and adjacent parts of the mainland in the states of Parana and Sao Paulo, Brazil. Its available habitat totals approximately 17,300 hectares (68 sq mi). The black-faced lion tamarin is threatened by the development of tourism, the harvesting of palm hearts, and further deforestation to provide more land for cattle ranching. *** The black-faced lion tamarin is one of the world's rarest mammals. *** The black-faced lion tamarin was given the scientific name Leontopithecus caissara after the fishermen who live on the island where it was first documented. In the past, the black-faced lion tamarin was considered to be a subspecies of the golden-rumped lion tamarin (Leontopithecus chrysopygus), which was itself once considered to be a subspecies of the golden lion tamarin (Leontopithecus rosalia). The black-faced lion tamarin was first documented by Western science in 1990 on the island of Superagui, Brazil. By 1995, surveys revealed that it occurred on Superagui and adjacent parts of the mainland in the states of Parana and Sao Paulo, Brazil. Its available habitat totals approximately 17,300 hectares (68 sq mi) (Rylands et al. 1997) . The black-faced lion tamarin is threatened by the development of tourism, the harvesting of palm hearts, and further deforestation to provide more land for cattle ranching (Macdonald 2001) . The black-faced lion tamarin's head and body length is approximately 30 cm (12"), and its tail is about the same length. It weighs approximately 0.60 kg (1.3 lb). (IPE 2004) . Twins are usually born (IPE 2004). The black-faced lion tamarin eats fruit, insects, nectar and plant exudates (Emmons & Feer 1997) . It is arboreal and diurnal. The black-faced lion tamarin occurs in groups comprising 2 - 11 members, with an average of 5 members per group (Emmons & Feer 1997, IPE 2004) . 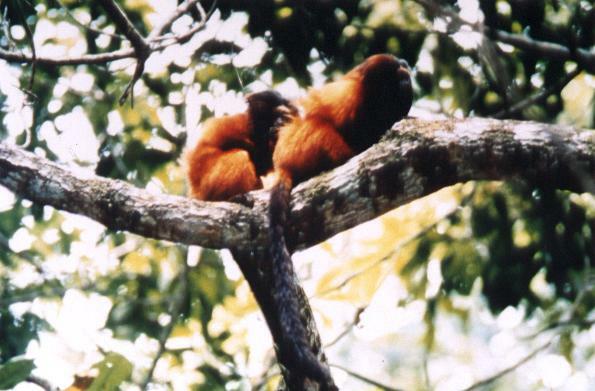 Lion tamarins generally occur in low densities of 0.5 - 1 group /sq km (1 - 3 groups/sq mi) (Macdonald 2001) . Black-faced lion tamarin groups occupy a home range of approximately 25 hectares (63 acres) (IPE 2004) .